The euro has weakened to its lowest level in a year versus the dollar in forex trading markets today. 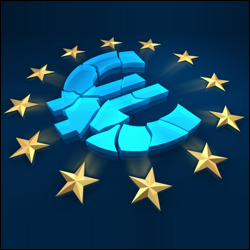 The moves came amid suggestions that the European Central Bank (ECB) is to introduce more aggressive monetary easing. Policymakers from the bank are set to meet on Thursday and the news conference that follows with President Mario Draghi will be closely monitored by investors. They will be looking for signs that he is preparing to introduce a full-scale quantitative easing (QE) programme in an effort to boost Eurozone economic growth and ward off the threat of deflation. Last month, Mr Draghi attended a central banking symposium at Jackson Hole, Wyoming, telling the gathered delegates that the bank is prepared to use 'all the available instruments' to shore up the region's economy, heightening speculation it will launch a Federal Reserve-style QE. This was fuelled further yesterday when official data showed euro-area factories increased prices only fractionally in August, while manufacturing activity in France declined at the fastest pace in 15 months. Separately, it was revealed the Germany economy, the Eurozone's largest, contracted in the second quarter of the year. As a result, demand for the euro has been weak in forex trading markets and the shared currency declined to $1.3110, its lowest versus the greenback since September 2013. Are Hopes of Policy Shift Overdone? Despite this, however, several prominent analysts have indicated forex investors may be expecting too much from this week's ECB meeting, even though additional easing is likely to be forthcoming in the near future. The bank introduced a negative deposit rate in June and also launched a small business lending scheme that came into force from the beginning of September. It is thought Mr Draghi may wish to delay action and assess the impact of these initiatives before committing to QE.